In April 2016, when Som Narayan, 32, and Kevin Houston, 65, agreed on a deal with Mahindra & Mahindra, it was the kind of association they had dreamt of. After being in the business of advising clients on reducing their carbon footprint and then producing bottled bio-CNG (a purified form of biogas) over the past eight years, they would be running a biogas facility at Malur, a town about 50 km from Bengaluru, for Mahindra Powerol, a generator manufacturing arm of the $15-billion Mahindra & Mahindra Group, for eight years. While Mahindra would spend about ₹7 crore on installing the facility, Narayan’s and Houston’s venture, Carbon Masters, would procure wet waste for producing biogas and organic fertilisers, and package and sell the gas. The plant, with a daily production capacity of 1,600 kg, was about eight times as big as their existing facility at Doddaballapura in Karnataka. Mahindra, on the other hand, was impressed with Carbon Masters’ focus on “sustainability”. “The Malur bio-CNG project is Mahindra’s first commercial waste-to-energy project, which not only generates green energy but also creates rural employment and supports the farmer community with the organic fertiliser. This very well synergises and supplements Mahindra’s vision of farm tech prosperity,” says Hemant Sikka, president–chief purchase officer, Powerol & Spares Business, Mahindra & Mahindra Ltd. But even as Houston and Narayan signed on the dotted line, they knew that a rocky road lay ahead. The company needed to make some investments to run the plant, and despite Houston, a former executive at Procter & Gamble, and PwC already having invested ₹50 lakh of his personal money, more was required. But fresh funds remained elusive, while the plant at Malur was nearing completion. It was not before another year that Houston and Narayan could finally breathe easy. Help came from an unlikely quarter. Konda Vishweshwar Reddy, a Member of Parliament from Telangana, whom Narayan had met at multiple conferences, introduced the duo to the Indian Angel Network (IAN). Soon, they found patrons in angel investors Nagaraja Prakasam and Mridula Ramesh, and Sangam Ventures, a sustainable energy-focussed fund backed by the Shell Foundation. 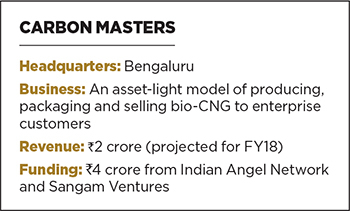 In June 2017, IAN and Sangam Ventures invested ₹4 crore in Carbon Masters, a crore more than the company’s initial ask. Today, Carbon Masters processes about 35 tonnes of wet waste, sourced from multiple waste procurement firms in Bengaluru, including Saahas and Hasirudala, and garbage contractors recognised by the Bruhat Bengaluru Mahanagar Palike (BBMP), to produce about 1,000 kg of bio-CNG and 10 tonnes of organic fertiliser every day at the Malur plant. Narayan expects the plant to run to its full capacity of 1,600 kg by March 2018. A few more plants are expected to come up next fiscal, he adds. Apart from this, Carbon Masters has developed an engineering unit in Bengaluru that will handle conceptualisation, commission and operations of biogas plants. The results so far have encouraged Narayan and Houston to aim for about ₹30 crore in annual revenue in the next three years, compared to the current revenue run rate of ₹2 crore. With every development, Houston and Narayan are moving a step closer to their dream of reducing carbon dioxide emissions into the atmosphere. An April 2017 report by the United States Environmental Protection Agency states that carbon dioxide accounts for 82 percent of the total greenhouse gases, when compared to methane’s 10 percent. Methane, however, absorbs 100 times more heat than carbon dioxide over five years, and 72 times over 20 years. Though methane breaks down faster than carbon dioxide in the atmosphere, its capacity to retain more heat makes it more dangerous. “The best one to tackle first is methane because it has a higher global warming potential,” says Narayan. “When you burn methane from a biogas plant, it gets converted to carbon dioxide [and moisture], but this is biogenic. But, when you take coal and burn, it is incremental carbon dioxide being released in the atmosphere.” This explains Carbon Masters’ biogas product, CarbonLites, which is 92 percent methane. It wasn’t a smooth start for us, says Houston, who started pondering over global warming after watching An Inconvenient Truth, a 2006 documentary by Davis Guggenheim featuring former US Vice President Al Gore. All hell broke loose when he decided to quit his consulting job at IBM in the UK to go back to school to study carbon management at the age of 55. “At the time, my three adult children were leaving university. They felt I was crazy, having a midlife crisis and had lost the plot,” he jokes. Houston met Narayan at the University of Edinburgh in September 2008, where both were studying for their master’s in carbon management. The two set up Carbon Masters, with an office on the university campus and four other employees, in May 2009, while still at university—with a 10,000-pound interest-free loan from the university’s incubator—to advise businesses on ways to reduce their carbon footprint. Over the next two years, Carbon Masters wangled projects from the European Commission in Brussels, the Edinburgh airport, drug manufacturer Pfizer and steel manufacturer Adelca; Edinburgh University, in fact, was their first client. The company clocked about ₹20 lakh in annual revenues in FY13. Towards the end of 2011, Narayan had to return to India. His visa had expired. “We thought it would be prudent for him to return [to India] and set up business here,” says Houston. And there was enough opportunity; or so it seemed. A 2011 report by Greenpeace said India’s telecom sector emitted 5.2 million tonnes of carbon dioxide annually, accounting for 2 percent of domestic greenhouse gas emissions, thanks to its enormous appetite for diesel. Early in 2012, the central government asked telcos to ensure that by 2020, at least 75 percent of towers in rural areas and 33 percent in urban areas should run on hybrid power. This gave Carbon Masters enough reason to set their eyes on the telecom sector. It was also a time when the garbage crisis in Bengaluru was at its peak: As villages around the city’s landfills began to protest, waste disposal within the city got held up, causing massive garbage pile-ups. Amid the stench, Narayan and Houston got the whiff of an opportunity to process wet waste to generate biogas, bottle it and sell the gas to businesses. In February 2013, they made a deal with Maltose Agri Products Pvt Ltd to operate the company’s biogas facility—it had a capacity of 200 kg a day—in Doddaballapura. Running the pilot project was essentially to identify potential business opportunities. 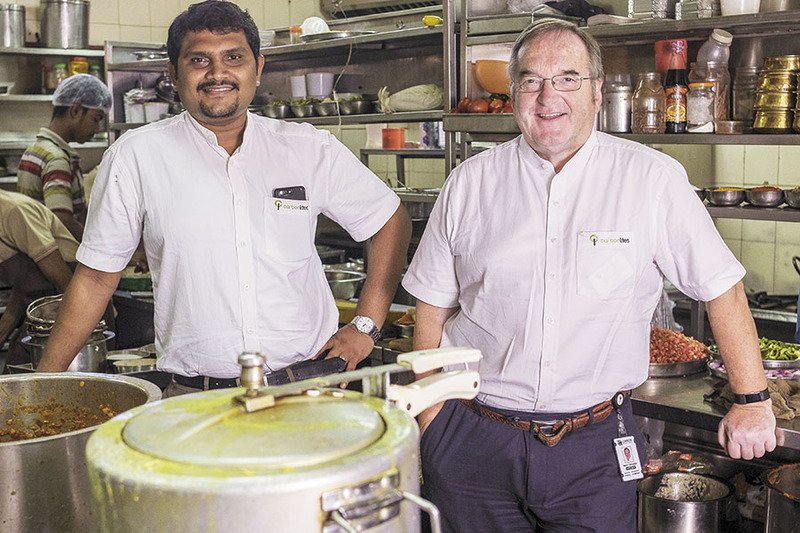 While a few pilots with restaurants and caterers were successful, running three Mahindra trucks on biogas in November 2013 catapulted Carbon Masters straight to the truckmaker’s boardroom in Mumbai. 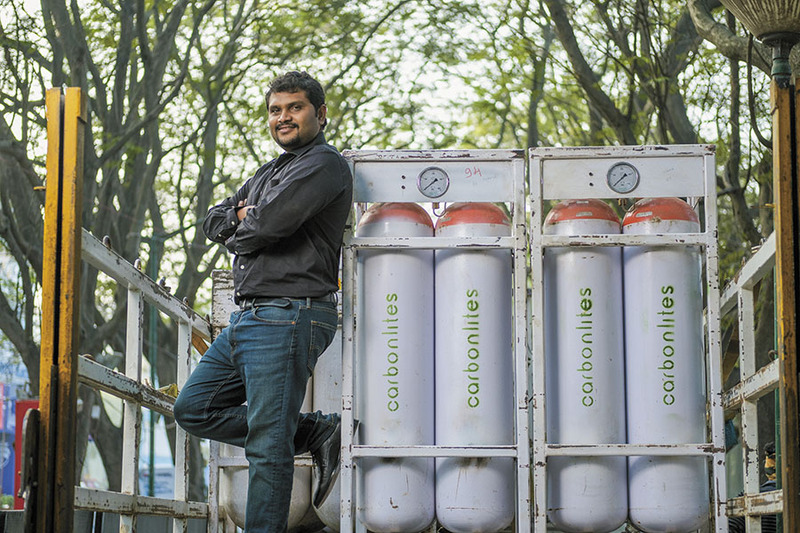 “They were the first biogas trucks in South India. The truck distributor rang up the Mahindra guys in Mumbai and told them about us. The company people then visited us on the plant,” says Houston. Things have only looked better since. The company now also supplies CarbonLites cylinders to about eight restaurants in Bengaluru, while work is underway to reach eight more cities in Karnataka and Andhra Pradesh. Given that CarbonLites is priced to match commercial LPG—Carbon Lites cost ₹60 per kg, while LPG costs ₹65 per kg—restaurant owners aren’t complaining either. Its asset-light model sets Carbon Masters apart from its peers, such as GPS Renewables, SustainEarth Energy Solutions, Green Brick Eco Solutions. “Startups lose their footing because they have to set up the plant, run it and then find customers. They neither have enough money to build a proper plant and bear operational expenses nor enough bandwidth for sales. The economics don’t work because eventually you cannot sell gas beyond a certain price. Hence, the model for Carbon Masters, where they just run the plant and sell the products, is impressive,” says Shyam Menon, co-founder and investment director at Infuse Ventures. Narayan is aware of the challenges of evangelising biogas adoption in India. He admits that creating awareness about biogas is one of his biggest challenges. But, his faith in the “waste-to-value” business does not waver. At least, his cylinders are selling.